DAVAO CITY, Philippines (Mindanao Examiner / July 13, 2010) – Some 200 people, backed by various civil groups, vowed Tuesday to fight off the intrusion in Mount Diwata of foreign mining firms in the gold-rich town of Monkayo in Compostela Valley province in Mindanao. They gathered at the Holy Cross of Davao College where the Solidarity Action Group for Indigenous Peoples and Panalipdan-Southern Mindanao Region held a forum to forge unities in response to issues related to large-scale mining in Mount Diwalwal. They said foreign firms often practiced destructive mining and urged Manila to implement a more responsible policy to protect the environment. The forum was part of the activities that eventually turned into a large-scale anti-mining campaign launched in cooperation with the Nagkahiusang Katawhan sa Diwalwal and the multi-sectoral Bagong Alyansang Makabayan amidst the looming take-over of large scale mining corporations of in Monkayo. “Aside from our continued advocacy and education campaign, this mining and environment protection forum aims to educate wide audience on the real costs and benefits of large scale and foreign mining and its deadly impact on local communities, their culture and livelihood,” said Francis Morales, Panalipdan Secretary General. Participants also signed a manifesto of unity leading to the formation of the Panalipdan Mount Diwalwal alliance. 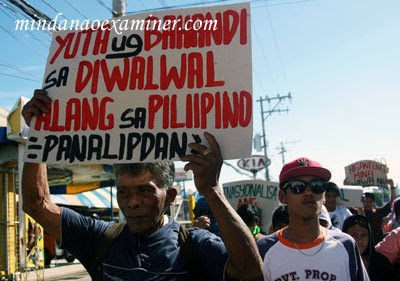 They later assembled in front of the Department of Environment and Natural Resources office from where they marched to the Philippine Mining Development Corporation and held a picket to dramatize their strong opposition against the “sell-out” of Mount Diwalwal to large-scale mining corporations. Meanwhile, a group of indigenous people in Bukidnon province belonging to the Panalsalan Dagumbaan Tribal Association slammed the issuance of a compliance certificate to a big rancher in Maramag town by the National Commission for Indigenous People Bukidnon, saying the certificate was based on an alleged fake Free and Prior Informed Consent. The group, composed of Talaandig and Haigaonon tribes, also called for the resignation of Datu Tomme Labaon, the regional director of the NCIP, saying he was biased in favor of rancher Ernesto Villalon, a former mayor of Kibawe municipality, and was insensitive to the plight of lumads. Datu Mahawan Alfredo Ganinay, chairman of PADATA, said Labaon refused to face them in a dialogue when they demanded the revocation of Villalon’s FPIC. He said Labaon also refused to answer questions from members of the media who waited for him outside the NCIP office in Cagayan de Oro City. “The FPIC is a fake. The tribal leaders consulted by Villalon were not even from our place,” Ganinay said. An FPIC is a document letter issued by a tribal group allowing a rancher to manage and develop a certain piece of land that lies within their ancestral domain. Ganinay, 60, said that Villalon obtained his FPIC from a lumad group in Kibawe, although the 480-hectare Villalon Ranch covered by the FPIC is located in the boundaries of the villages of Panalsalan and Dagumbaan, both in the town of Maramag. “The ranch is located in our ancestral domain. Former Mayor Villalon should have consulted us. 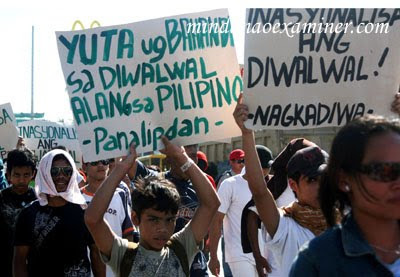 Instead, he obtained an FPIC from a different group of lumads. This is a violation of the FPIC process under NCIP Administrative Order No. 1, Series of 2006,” Ganinay said. He said the property is covered by their application for Community-Based Forest Management, which they filed at the Department of Environment and Natural Resources in November 2007.